Soft Washing -> National Softwash Alliance -> National Softwash Alliance Blog -> What is Efflorescence and how do I get rid of it? 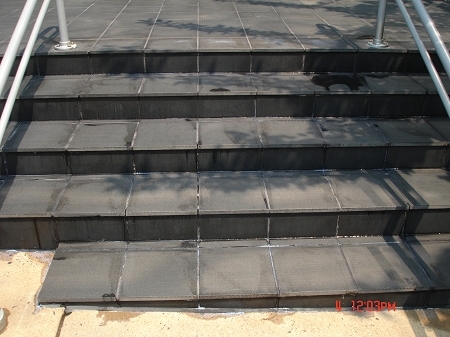 TOPIC: What is Efflorescence and how do I get rid of it? Efflorescence evolves into various forms and because of this, there isn't always one easy solution to remove it. In this post, I'll talk about how efflorescence occurs and some cleaning strategies. As a manufacturer, we provide cleaners for hard to remove efflorescence issues but often times there are easier ways to go about cleaning the "salts" from the surface and I encourage any readers to discuss their own solutions in this blog. 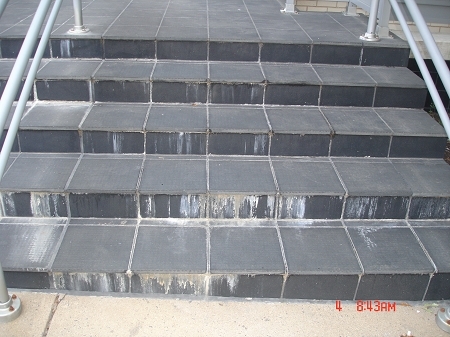 WHAT IS EFFLORESCENCE & WHY DOES IT OCCUR? Efflorescence in its most general form is comprised of water-soluble salts that migrate to the surface of the masonry (or concrete) via water or vapor transmission. Water is always the active agent that brings efflorescence to the surface. You tend to see it worse on retainer walls because there is ground source water on one side "pushing" the water/vapor to the opposite "exposed" side of the wall, as well as, rain falling on the exposed wall that will help "draw" the salts to the surface. Efflorescence most often looks like a powdery white deposit but it can also look grey, black and even green depending on the region of the country and type of salt composition. Water carries the dissolved salts to the surface and as it evaporates, it leaves behind the crystalized deposits. In this "early stage" of efflorescence development, it's usually pretty easy to just brush away the salts or use a weak, water-based solution to dissolve them. Yet these early stage deposits are only water soluble for a brief period before the carbon dioxide in the air converts the deposits into water insoluble (calcium) carbonates that harden. Over time these carbonates can grow like a stalactite and the pores will close up. At this point, even a strong acid cleaner can just bounce off the surface. As previously mentioned, in its earliest form the salts can be easily removed. Once the carbonates have formed, it often requires a combination of mechanical and chemical effort. That means using a stiff bristle brush to "open up" the pores and mechanically trying to knock away as much buildup as possible before going chemical. Yes, labor costs should be adjusted higher for these scenarios. A muriatic acid wash is often used, but you should take care as too strong a solution can burn the brick/concrete and too weak a solution will bring the pH up too high to have any effect. Whichever cleaner you try, if using a power washer to rinse be sure to hold it at an angle to the wall. 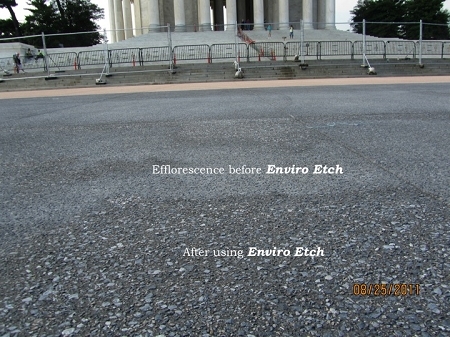 Direct injection of water can cause additional efflorescence to be drawn to the surface. 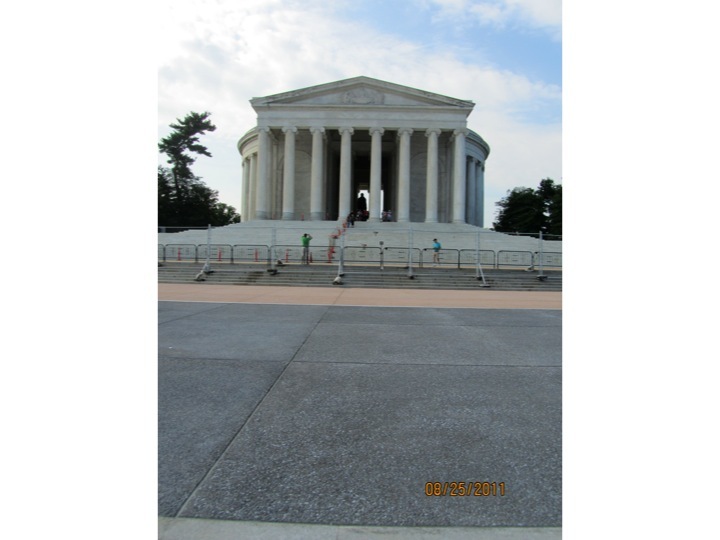 This project for the National Park Service entailed removing efflorescence from 17,000 square feet of new colored aggregate concrete. As the concrete cured it began drawing the salts to the surface and became very noticeable against the dark grey surface. Because the concrete was so new (tender) we decided to use our EnviroEtch which although is a 1 pH acid, it is more buffered and not acidic to human touch. In this case, the efflorescence was bleeding out of the mortar joints. Mortar joints are often subject to this problem because the sand used to make the mortar can be contaminated with soluble alkali sulfates which leach to the surface. Problem it seems with efflorescence is once removed,.even if done properly,..it still seems to come back,..I think simply because it's the nature of the beast. Removing a layer of it for appearances sake is fine I suppose,..but it won't last very long,... a wet look sealer will hide it for a while also. So you guys like efflorescence to return quickly so you can insure work? You guys must do an awful lot of it to have this mindset on efflorescence. I'd rather remove it and never have it return. But,..whatever floats your boat I guess and keeps money in your pockets. Not for me though,..I have many other things to do other than sell customers a bill of goods on efflorescence. I have many other things to do other than sell customers a bill of goods on efflorescence. Trust me......If I can make something go away and never have it return that is my preferred method. I have made more money doing things right than not....the referral is worth more to me than any return trip. I don't see this business in that fashion however. I just don't think we can "fix" much of anything because Mother Nature will not let us. She will always undo our good deeds.....it's just a matter of time. So now we "fix" things to last as long as possible and sell maintenance packages to keep them away. I Agree Doug,..but I've seen efflorescence return so quickly that it didn't really even seem worth it to the customer to pay to have it removed,..let alone me taking their money for what I deemed a worthless effort. Returning to a customer to wash a house or concrete that has dirt and mold isn't the same thing I don't think. You're right,..that is what mother nature does and the return work is nice,..in the sense that it does insure work,...BUT,..only after my best efforts to do a good job and sell what I think is worth it. Actually,..I have many customers that I do every year,..and the mold is almost non-existent from year to year now. But efflorescence isn't really mother nature,..it's coming from inside man made materials,..and is inside the material in layers so to speak. Never ending it would seem. At least with mold and dirt we can remove it and give a good long lasting result for the money. I just don't think that is the case with efflorescence is all. I turn efflorescence work away anytime it comes up,..with an explanation and a recommendation on using a wet look sealer to at least hide it. There was a local business group I work for that paid ALOT of money to have nice brick pavers put down in front of their business's. In about 5 years the efflorescence started,..and they asked me to clean it. I turned it down with the explanation and the recommendation of the sealer. Last year I seen a guy in working on the efflorescence,..he had it all removed,..and in about 2 months it was back way worse than when he started. And now it looks REALLY bad. But when it rains it's mostly hidden. And is why I recommend a wet look sealer. *Not trying to make an issue of who does what with their business,..I just like to inform others of my experiences with efflorescence,..which I've had many. If it is gone when you leave and the substrate is dry you have done what you were hired to do. I can sorta get behind that Andy,..especially if the expectations are disclosed. And I guess that is up to the contractor,..I just prefer not to leave my name on that type thing is all. Reviving an old thread and want you's guys feedback on what you's guys find been the best or newest product, chems to treat efflorecence? Ive always used muriatic acid watered down but maybe something prepackaged as I dont always trust new helpers with dangerous chemical handling. Looks like you're in my area again Maverick! The nerve of them to live in your territory! Tell you what, you can have everything EAST of Montauk.